"I'm gunna make this right." 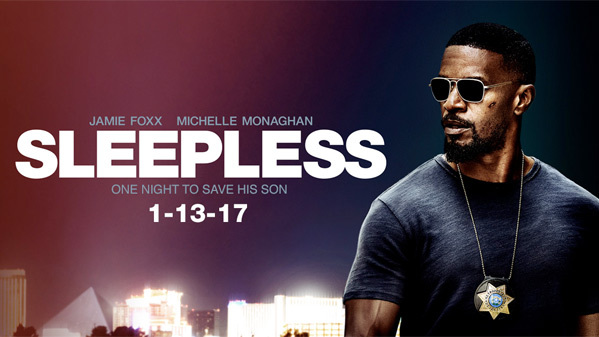 Open Road Films has unveiled one final red band trailer for Sleepless, the American remake of the French action film Sleepless Night. This violent action movie stars Jamie Foxx as an undercover cop who angrily heads into a nightclub to search for his kidnapped son. The cast features Michelle Monaghan, David Harbour, Dermot Mulroney, Gabrielle Union, Scoot McNairy, T.I. and Sala Baker. This isn't much of a red band trailer, there is barely anything to it, which is probably a metaphor for this movie. Early word is that it's really bad. You're better off just watching the original film. A cop with a connection to the criminal underworld scours a nightclub in search of his kidnapped son. Based on the 2011 French film Nuit Blanche, also known as Sleepless Night. Sleepless is directed by Swiss filmmaker Baran bo Odar, of the films The Silence and Who Am I previously. The screenplay is written by Andrea Berloff (Blood Father, Straight Outta Compton), based on the original 2011 film written by Frédéric Jardin & Nicolas Saada. Open Road Films will release Sleepless in theaters starting January 13th this month. Rather than see this, you're better off watching the original French movie. Anyone want to see this? If you go into this knowing what it is, it has the potential to be glorious. WOW, this looks effing terrible. Setting up the baseball scenario would take way too long for gangsters. Looks quite funny. Amazing how Jamie Foxx's rhetoric against white people tones down when he has a movie to sell. I quit supporting his crap some time ago when it became clear of his axe to grind. Jamie Foxx looking good, but...... "If you are looking for ransom, I can tell you I don't have money. But what I do have are a very particular set of skills; skills I have acquired over a very long career. Skills that make me a nightmare for people like you. If you let my son go now, that'll be the end of it"